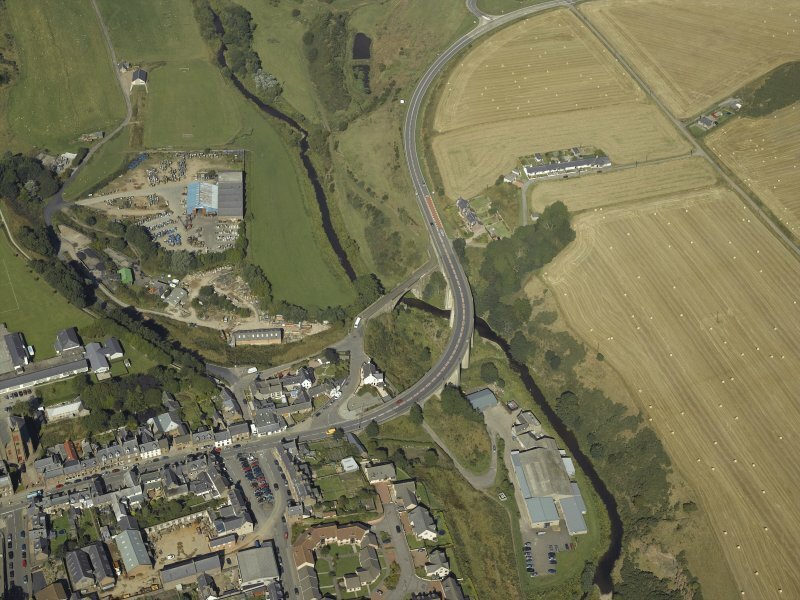 Oblique aerial view centred on the road bridges, taken from the E.
Oblique aerial view centred on the road bridges, taken from the SE. 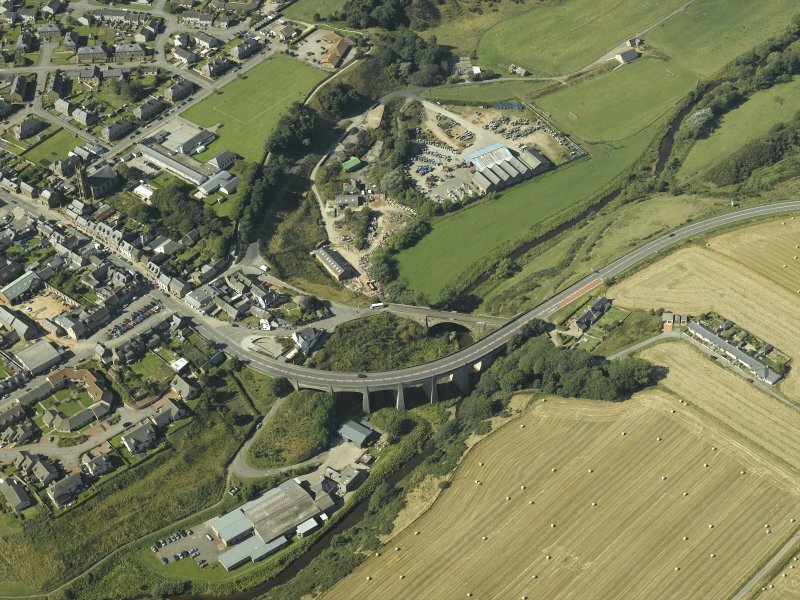 Oblique aerial view of the bridges at Inverbervie, looking to the SE. For (adjacent, successor and present) New Bridge ('Bervie Jubilee Bridge'), see NO87SW 67. (Location cited as NO 831 729). Old Bridge, built 1799. A single segmental arch 103 ft (31.4m). The arch ring is of dressed stone, and the spandrels and abutments are rubble-built. The abutments are hollow, with windows. Now by-passed, used as a footbridge. 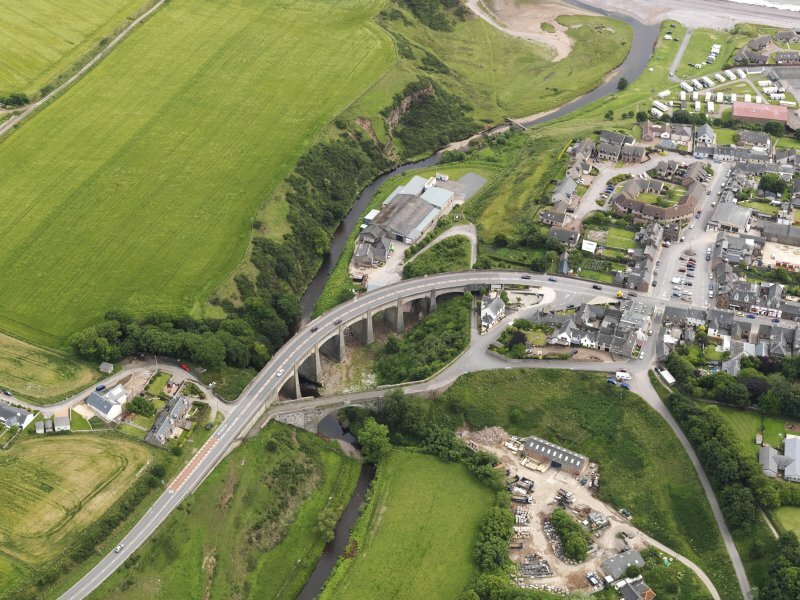 Old Bervie Bridge: Single segmental arch, 103ft span, 80ft high, rubble, dressed voussoirs, pierced spandrels and and rusticated abutments containing vaulted cellars. Parapet rail dated 1799. Parapet rail dated 1799. Disused. 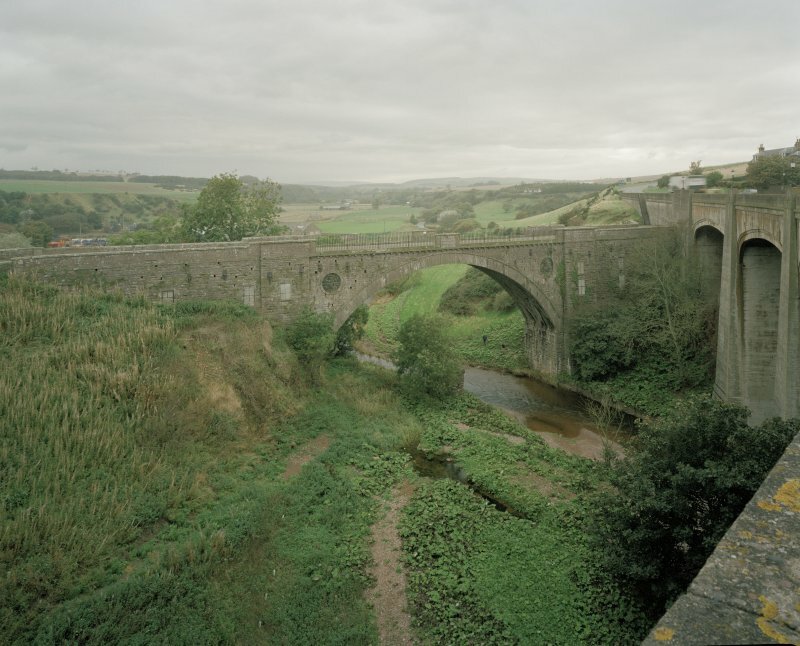 This bridge carries the former line of the East Coast main road across the Bervie Water, which here forms the boundary between the parishes of Bervie and Kinneff. 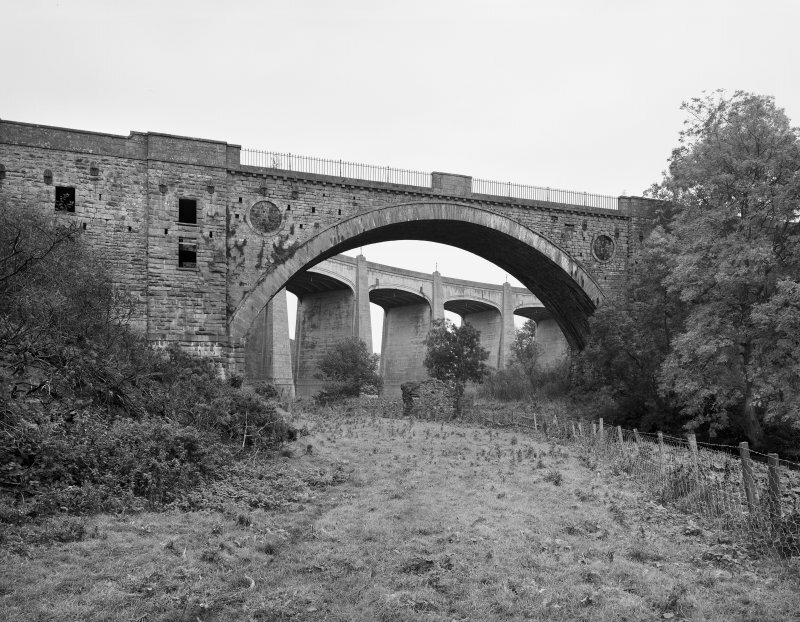 During October 2000, Old Bervie Bridge was visited and surveyed by a RCAHMS photographic team. The purpose of this survey was to enhance and augment the existing holdings of the National Monuments Record Scotland. At time of this, the bridge was still in use as foot bridge. Visited by RCAHMS (MKO), August 2000. 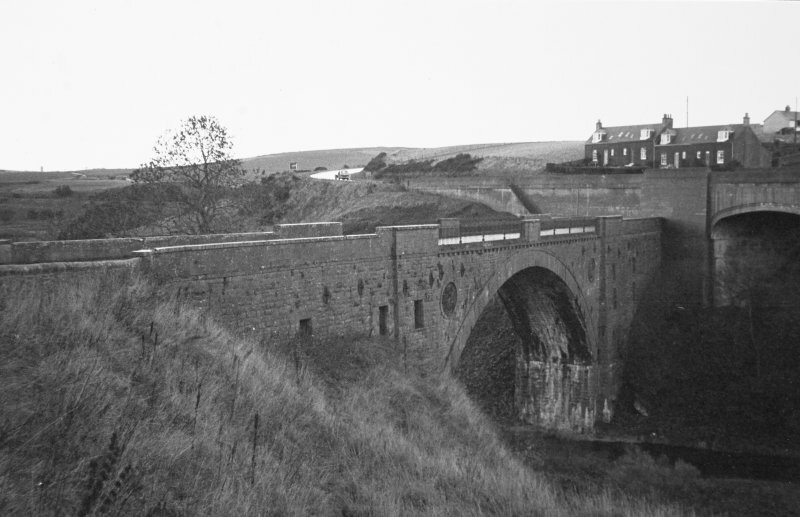 Old Bervie Briudge, 1799, a single 103ft [31.4m] span with pierced spandrels and vaulted cellars for storing coal and lime in the abutments. concrete bridge seen in the view. The first flax spinning mill in Scotland, using Kendrew and Porthouse’ patent, started here in 1787. There are several small water-powered mills and their warehouses dot the haugh, the valley below the town New Bervie, off Cowoff Cowgate, NO 8323 7283, NO87SW 68 1887; Pitcarry, by 1820, Upper, 1826 (NO 82368 73418, NO87SW 50), and Lint Mill 1832 (below Jubilee bridge), followed by three small steam powered mills up in the town: Laurel Mill (Church Street, 1877), Spring Works / Klondike Mill (warehouses off High Street, 1885, now a bus garage), Craigview Mill (High Street, 1907; closed 1992, replaced by a housing development. There were three steam powered flax mills in nearby towns: Johnshaven, (1896, M13), Selbie in Gourdon (1908, closed 1997, demolished) and Invercarron, Stonehaven (1914, demolished). Selbie Works was the second last flax/ jute mill in Scotland, and its ability to switch from one material to another made it regarded as a barometer of the industry. These mills were able to operate as part of the Dundee industry thanks to the rail connection. Also see M12. 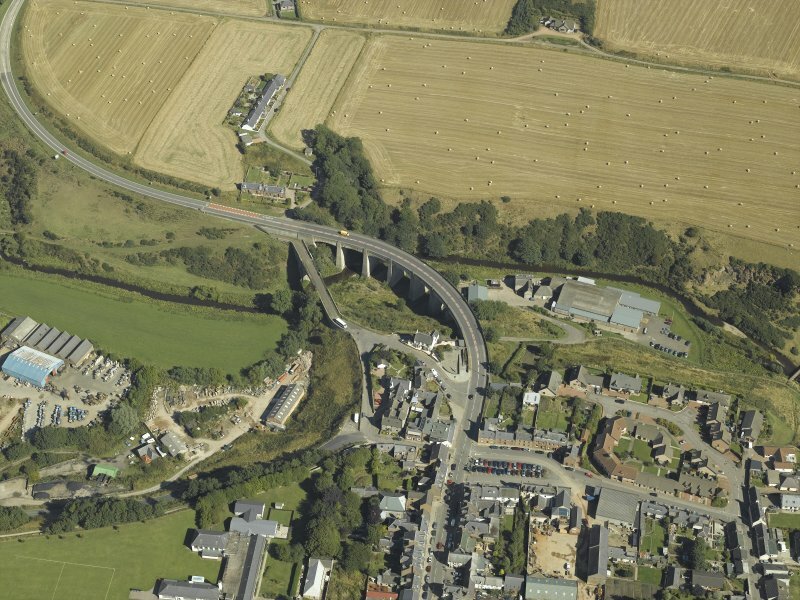 Inverbervie Old Bridge (NO 83143 7290) was built in 1797-9 by James Burn, 102ft (31.1m) span and 80ft (24.4m) high with vaulted embankments, chambers in the abutments reputedly a prison. It was bypassed by the curved new reinforced concrete 7-span Jubilee Bridge in 1935-6. At one end is a scale replica of the Cutty Sark figurehead. Hercules Linton, her designer, was born here.